As part of a bigger awareness effort, Myeloma awareness wristbands can improve knowledge of this deadly disease. Improved awareness leads to more funding and better treatments. March is Myeloma Awareness Month. Myeloma is a blood cancer that starts in the plasma cells within the bone marrow. Many events occur during March to raise awareness of myeloma and multiple myeloma. The recognized awareness color for myeloma awareness is burgundy. When you design your myeloma awareness bracelets with Amazing Wristband’s online builder, you can combine colors in a segmented or swirled effect. 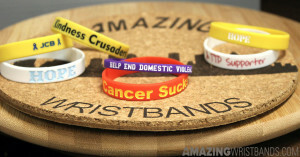 You can also add special artwork, such as an awareness ribbon, to your custom silicone wristband. Wellness is more than just a trend, it’s a way of life! Lifestyle changes can sometimes be difficult to commit to, and that’s where wellness wristbands can help. As a daily reminder of a commitment to wellness, custom silicone bracelets can give people the motivation they need to stay on track to better health and wellness. Orange color wristbands stand for a variety of different causes, and selecting the color orange can give your message more impact. If a picture is worth a thousand words, a color is worth even more! The color you choose for your personalized silicone bracelets can mean many things. When it comes to awareness, every color has a special meaning. 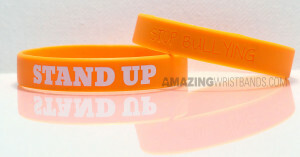 What Do Orange Bracelets Symbolize? Orange is a vibrant color, often associated with health. Orange is abundant in nature, from its fruit namesake to sunsets, flowers, and fish. Orange symbolizes energy, vitality, excitement, adventure, warmth, and good health. Different shades of orange have different meanings. Darker oranges offer a sense of comfort; some are spicy, some are earthy. Lighter oranges are soothing and healthy.